The past four days have seen widespread protests and rioting against the announcement of the new minimum wage structure for Bangladeshi garment workers. The industry's monthly minimum wage was last raised after the mass revolt of 2006. The increase, to Taka 1,662[£15/$23/€18], was already inadequate - and since then inflation of basic foodstuffs has risen over 70%. While workers were demanding Tk 5,000[£45/$71/€54], the final offer from the tripartite negotiations between government, the employers federation BGMEA and a minority of claimed labour representatives (who have little actual influence over workers) was Tk 3,000[£27/$42/€32] - an effective wage cut. Breaking a previous agreement, the increase has also been delayed until November - thus conveniently missing out the workers' Eid holiday bonuses due before then. A union leader who opposed acceptance of the increase said "...in the sixth grade, workers would get paid Tk 3,210 a month and about 50 per cent of the total apparel workers fall in this grade. Workers in the seventh grade being promoted to the sixth grade will have an increase of only Tk 210 in their wages..."
Subarna, an 18-year old lady, works in a garment factory at Mohakhali in Dhaka city. She is married to a young man who also works in the same factory and has one cute child: a two-year old son. This 3-member family lives in a tiny room of tin shed measuring 10 feet by 8 feet with a low ceiling at a slum area known as “Korail Bosti” ( urban slum ). “Korail Bosti” ( urban slum ) a huge area near Gulshan where thousands of garment workers along with thousands of other petty technicians, day laborers and low-paid servicemen live with their family members in inconceivable congestion---more than crammed like sardines---in a multitude of sheds so densely erected that it is hard for one to move with a handbag stuffed with shopping through any of the narrow pathways provided in between the sheds. These makeshift houses are constructed on government-owned land and rented out by some local musclemen who wield enormous strength to thwart any move from any quarter to question their right of renting the slum dwellings. Subarna pays Taka 1,500 for house rent and her other monthly expenses include Taka 360 for three electric points---one light, one fan and one television and Taka 200 for cosmetics and toiletries. Her daily expenses include Taka 42 for 6 Kg firewood, Taka 64 for 2 Kg rice, Taka 20 for half liter cooking oil, Taka 10 for onion and garlic, Taka 12 for vegetables, Taka 16 for potatoes and occasionally Taka 50 for fish. One particular expense Subarna hates to defray is on cigarettes her husband smokes draining Taka 25 every day from her skimpy budget. Every month Subarna and her husband earn approximately Taka 14,000 and spend Taka 11,000 for their own consumption and remit Taka 2,000 to her ailing father living at Charfashion in Bhola. Nazma Akter, president of Sammilito Garment Sramik Federation, a platform of 40,000 garment workers, welcomed the announced minimum wage at Tk 3,000 for the entry-level workers. Akter, a former garment worker who has gained a foothold on the career ladder of NGOs and international lobbying has previously been happy to collaborate with garment bosses and publicly lie to deny any workplace abuse of garment workers(1). The National Garment Workers Federation(2) also accepted the offer. Both Federations have condemned violent protests by garment workers and the NGWF have, absurdly, denied worker involvement. ‘The workers are not involved in the on-going violence in the apparel industry,’ Amirul Huq told reporters after the meeting He called for identifying and punishing those involved in the recent incidents of violence. http://www.newagebd.com/2010/aug/02/front.html#3. The BGMEA president, Abdus Salam Murshedy, has said garment factory owners are unable to implement the increased wages of the workers in next three months as global recession and infrastructural bottlenecks have affected their business. ... Talking with reporters in his office on Friday, Murshedy insisted that the factory owners needed some time to implement the new wages. ... The major buyers, however, have raised the prices of garment products, especially the knit products, by around 30 per cent in recent weeks, industry people said. When asked about the price rise of the RMG products, Mr Mohiuddin said price rise will actually compensate for the raw materials', including cottons', prices which went up following production shortfall in the major growing countries. The prices of raw cotton remains stable at $1.50 a pound. The price of 30-count yarn also remains stable at $ 3.90 a kilogramme (kg). The buyers including New Wave of Sweden, Terna of Italy, Wlimp of Germany, Jerge of Germany, Metro of Germany and Flazeazer of England have raised the prices of garment products ranging 20 to 30 per cent, industry people said. "Buyers have increased prices of the garment products leading to larger export earnings this year," said Ashraful Hassan, managing director of Grameen Knit. The apparel sector fetched $12.59 billion out of the country's total export worth $14 billion in the last fiscal. "My buyers who earlier used to pay $1.5 for a piece of T-shirt now are proposing $2.0 for the same," Mr Ashraf added. He said buyers have now realised the hardship facing the local garment manufacturers and started offering better prices. Industry insiders said 'discount-buyers' who dominate the Bangladeshi market also started to increase the prices for the RMG products. Apart from this, the export of apparel goods also increased in April over the same period in 2009. Garment worker Parvin said, "We were forced to take to the streets as the owners exploited us right under the government's nose. I have to spend Tk 1,000 for food and Tk 1,500 for house rent. How will I maintain other things with this wage?" "Moreover, the factory owners want to deprive us of the increased Eid bonus by trying to implement the wage structure from November," she added. 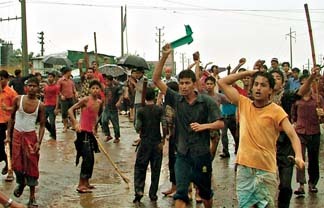 In the central district of Mohokhali around 3,000 workers attacked police, stoned factories and blocked a flyover, said local police chief. "We have the situation under control, but there are still protests erupting in other parts of the city," he said, adding that several factories in his area had been seriously damaged. Meanwhile, at Tejgaon Industrial Area, protesters broke into a dyeing factory; massive piles of fabrics were dragged into the road and burnnt to ashes. At least 20 people, including five cops,were injured in the clashes. Late on Friday night police began raids against union leaders. Montu Ghosh, an elderly labour leader, Communist Party official and Garment Workers Trade Union Centre adviser was arrested and charged with instigating workers’ protests. Ghosh had been outspoken in opposing the wage settlement. Several other labour leaders were reported to have also been arrested. Another indication of the limited influence of these 'leaders' is that their detention had no effect on the intensity of the protests - except to add calls for their release as another demand. These "unelected" representatives were denounced by 14 other union leaders for acceptance of the deal. On Saturday Prime Minister Sheikh Hasina told "workers to accept the pay hike and return to work", threatening tough action against those who remain on the streets. ... She said tough action would be taken against the people who are creating anarchic situation in the garment sector over the minimum wage. ‘We will not spare anyone who is behind this. We will find out the provocateurs and try them,’ Mahbubul Hoque Shakil quoted the prime minister as having said. Dhaka Metropolitan Police commissioner AKM Shahidul Haque on Friday warned against any attempts by any quarters to destabilise the country’s garment sector in the name of wage demands. [...] He said the authorities would show ‘zero tolerance’ to any attempts by any quarters to disturb law and order. Terming practical the new RMG wage structure announced by the government, the DMP chief urged garment workers and leaders to accept it. ‘We will arrest the persons who are hatching conspiracies to destabilise the top foreign exchange earning sector. We will find out the troublemakers and take stern action against them,’ he warned. In the days since, in the various garment factory zones, similar clashes have continued as workers continue to demand a higher wage. Thousands of workers have fought police, blocked roads, attacked and looted factories and forced hundreds to suspend operations, attacked hundreds of businesses, shopping centres and banks. Massive numbers of armed police and the para-military Rapid Action Battalion have occupied the garment areas; but even when prevented from taking to the streets, workers have stopped work in the factories or not turned up for work. At one factory, "Witnesses and police said around 1000 workers of Liberty, Metro and Micro Fibre garment factory staged demonstration inside their factory wearing red cloth on their head ... to press home their demand." Employers have also closed many factories, fearing further trouble. The continued labour unrest and disruption in the garment industry - alongside infrastructural problems of energy supply shortages that regularly interrupt maximum productivity - are worrying both foreign buyers and local suppliers. The narrow national economic dependency on a single export industry's ability to deliver competitive rock-bottom prices and reliable fast delivery times means garment workers still have considerable weaknesses to exploit in the class struggle. The government and employers may finally - after years of hinting at it whenever labour unrest reaches a certain peak - begin to allow full trade union representation in the sector. But the majority of labour leaders, having now been courted to play the role of giving legitimacy to the miserable settlement, may have lost more than they've gained. The state and bosses could easily again break their promises on union recognition - and, as they continue their struggles, the most militant workers will not look kindly on the unions' class collaboration and meek acceptance of the poor wage offer. Massive deployment of security forces in the industrial belts along with sweeping raids and arrests have, for the moment, quietened the unrest. But, with little resolved, the antagonism is set to continue. 2) The US section of the Industrial Workers of the World has cultivated links with the NGWF - see comments below article here; http://libcom.org/history/video-machinists-against-machine-bangladeshi-garment-workers-struggles Like other Bangladeshi 'unions', the NGWF - which itself has close links with Western NGO's - appears to function more like an NGO than a labour union. Any idea how much publicity these struggles get in Pakistan and India, and whether they have any encouraging influence there (or elsewhere)? I know they do get reported occasionally in Nepal and India, but no, I don't know to what effect. But there are lots of migrant workers moving around between different Asian countries, so I guess word spreads by that route to some degree. Samotnaf; I just heard that these Bangladeshi articles are now being translated as they appear into Hindi and distributed as hard copies in the Gurgaon workers newsletters in India.